This week brings us into the heartcenter of Leo season, a moment to acknowledge the light and heat of your divine self! Though it may be true that there is a well of consciousness that is a common source to us all, it is also clear that there is some great purpose for having the distinct experience the individual self. The Sun’s transit through Leo is the season that cultivates the unique expression of the Self, encouraging its continual development through the heartfelt heartbreaking love for life. Remember that this Self is much more than personal preferences and social identifications. Rather, the Self that Leo is seeking to know is a unique aspect of divinity: that spark that forever glimmers within. As the Sun in Leo shines through you, embrace the regal qualities that invite attention, admiration and honor through noble actions. You may feel called to add some dramatic flourishes to your presentation and performance. You may feel like dressing in a more expressive manner. You may feel like speaking in a more evocative tone. You may wish to add an extra layer to your art that bespeaks of your enthusiasm. Whatever emerges from you during Leo season, accept your playful impulses and enjoy the fragrant flowering of creativity. This week will also bring in a cool mist of comfort. Like a soft-focus filter, Venus will enter Cancer on the last day of July, inviting a half-lidded vision of blurred beauty. Under this transit, there will be a renewed appreciation for your intimate circle of friends and family. The real joy for Venus in Cancer is to be enriched by the past, meaning that family traditions as well as cultural traditions will have a sensuous and delicious quality. This transit is an especially good time to visit historical sites where the echoes of the past can sweetly sing to you. To best understand this week’s placements of the Sun in Leo and Venus in Cancer it would helpful to examine an historical figure that embodies the Leonine capacity for authentic self-expression as well as the Cancerian qualities of maternal softness. Such a character can be found in the personage of Elisabeth Vigée Le Brun. 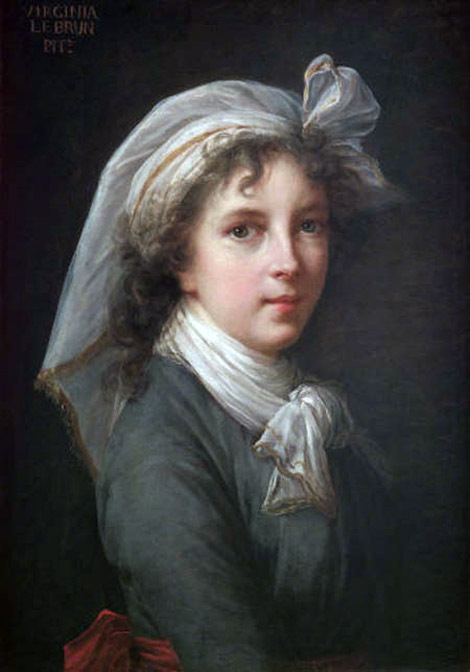 Elisabeth Vigée Lebrun was one of the most celebrated women artists of eighteenth century France. She lived through a period of profound social and political upheaval, which culminated in the French Revolution. Vigée Lebrun was born to a family of artists and was trained to practice her painting from childhood. The feminine elegance of her style and her ability to produce idealized images of her subject kept very popular within royalist circles. She was eventually appointed by Queen Marie Antoinette to be an official court painter. Her portraits of Queen Marie Antoinette were considered provocative by both critics and the public. Vigée Lebrun’s portraits were great feats of feminine artistic achievement, with loose brushwork, bright colors, and loving grace. But in the rising tide of revolutionary turmoil, they were defamed for being decadent and indecent. Even more interesting than her delicate portraits of Marie Antoinette were Vigée Lebrun’s self-portraits. The tradition of the self-portrait in Western art did not become a significant trend until the Renaissance, when portraiture became more naturalistic and concerned with capturing the uniqueness of the individual. Artists were legendary and heroic during the Renaissance, thus their self-portraits became an important method for capturing the divine spark of individual genius. 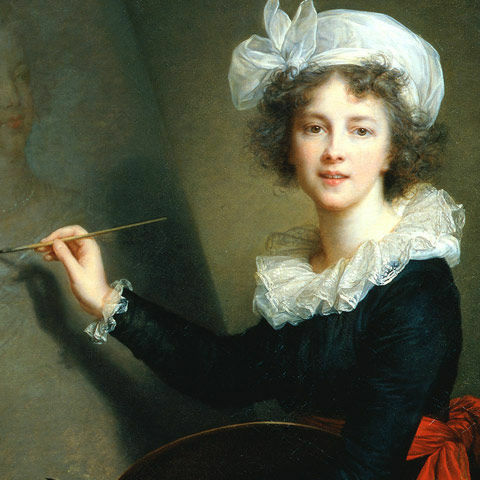 Centuries later, the self-portraits of Vigée Lebrun are undoubtedly some of the most beautiful ever painted. Not only do they seek to capture the divine spark within the artist, they also document and reflect the intensely personal evolution of one of the most successful woman artists in history. Her next self-portrait was inspired by the Renaissance master, Raphael, Self-Portrait of the Artist (Louvre, 1786). This tender self-portrait reveals her to be a devoted mother, in the spirit of Raphael’s Madonna of the Chair. In choosing to portray herself as a mother, Vigée Lebrun had done something provocative once again. It had long been the fashion for women artists to depict themselves as worldly and learned ladies, as working professionals with books, instruments and easels. Fearless of losing credibility as a serious professional women, Vigée Lebrun chose to emphasize her maternal role. 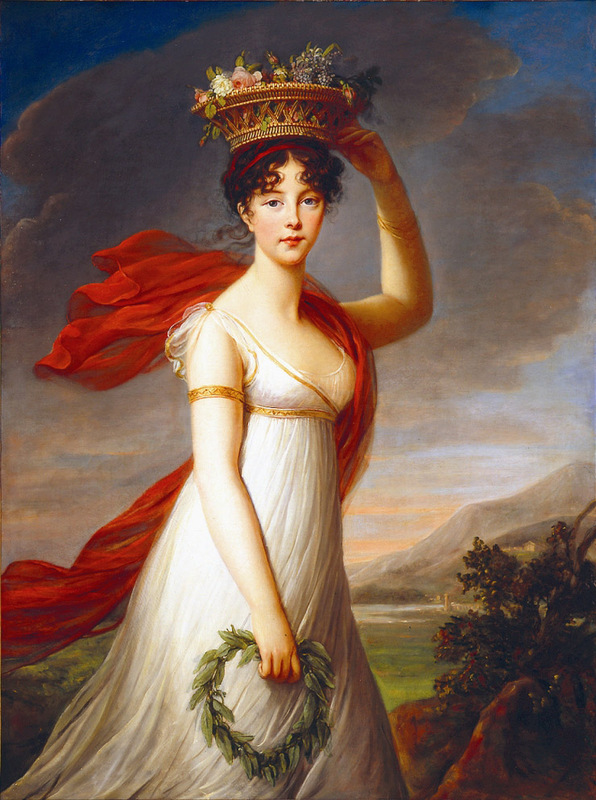 Due to her close connection with Queen Marie Antoinette, after the Revolution, Vigée Lebrun was forced into exile. The self-portrait she did in the first year of her exile reveals a melancholic color scheme, revealing some mourning for the colorful world of Versailles. But if any word could be used to describe Vigée Lebrun best, it would be courage. She asserted her vision as an artist from the beginning of her career, no matter how out of step with fashion or decency her tastes might have been. And she was not defeated by the Revolution nor her exile. In fact, she never stopped painting and she lived to be 86 years old. Vigée Le Brun’s work is an exemplary expression of the Sun in Leo’s vital warmth and self-awareness mixed together with Venus in Cancer’s sentiment for sweetness and intimacy. Let her boldness and softness inspire you this week, lending the scope of your imagination a new palette of fresh bright colors. On Monday, Venus floats out of the frantic terrain of Gemini and into the sanctuary of Cancer, where the most delicate of roses are tended and protected unto maturity. The most sensitive qualities that you have will become heightened. In other words, you will be feeling all of your feelings. The natural response to Venus’ time in Cancer is to retreat from environs that are overstimulating. Spend your time engaging with those who feel like home to you. Let your imagination vitalize your most beloved memories, painting an autobiographical story in living color. On Wednesday, Uranus will station retrograde in Aries and it will remain in retrograde motion until January 2018. This elongated period of retrograde Uranus will focus the innovative and revolutionary energies inwardly, creating space for some radical shifts in attitude. Above all, this retrograde period of Uranus is an exultant time to appreciate you sense of individuality, which is your divine gift. It may be helpful to draw an analogy between Uranus and the great god Prometheus, as Richard Tarnas does in his epic astrological text: Cosmos and Psyche. Prometheus was the Titan who stole fire from the gods and gifted it to human beings, thereby liberating them with the light and logos of divine consciousness. So during this period of Uranus’ retrograde, connect to that Promethean spark within and feel gratitude for the free-will and sentience that it affords. Release self-negating thoughts and liberate yourself from the slavish desire to have power over others. The radiance of your individual expression of the divine is all the influence that you need to make a difference in the world. The weekend will resonate with the impact of Jupiter in Libra square Pluto in Capricorn, which is exact on Friday. This is the third and final square between Jupiter and Pluto since November 2016. This series of squares has been putting a great deal of pressure on you to embody a lust for life and develop more of an appetite for paradigm shifting experiences. This process has included as much joy as it has sorrow. Your desire for power, influence, love and money may have been rising like a primordial dragon from the deep. While this surge of energy may have been exhilarating, it is also terrifying to realize that these voracious hungers know no end and can never be satiated. So this weekend, as this tension between Jupiter and Pluto perfects for the last time, circumvent the mania and aggression that this aspect can summon by identifying something about yourself that you do really truly need to release. Find some way to ritualize this shedding of an old skin. You might get rid of some items that keep you bound to an old identity. You might write down a list of bad habits that you possess and burn them. You might simply resolve to stop gossiping or complaining for 72 hours and see how that will affect your perspective. You can make great progress towards becoming a stronger and more powerful person this weekend, but remember to work on your integrity rather than trying to control others. Remember that never in history has a revolution wrought from mania and violence brought anything but misery. Instead, hold your head high and conduct yourself as a philosopher king or queen, one that rules by the light of the logos within.